My good friends and family that know me well know that I love pizza. It is absolutely one of my favorite foods of all time! 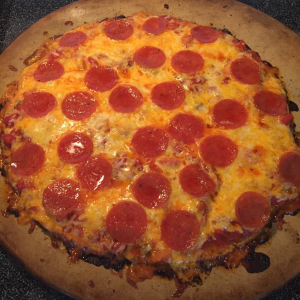 I’m always trying to find ways to make it a little healthier and have experimented with many homemade pizzas. 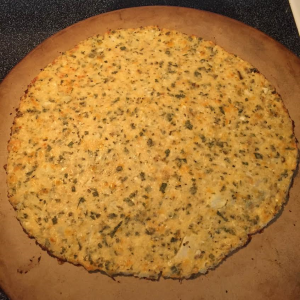 I have always wanted to make cauliflower pizza crust and I finally got around to it. It turned out really good. My family couldn’t even tell it was cauliflower! First start with 2 cups of cauliflower finely chopped (I used my Blendtec but a food processor would work great too). I microwaved it for 4 minutes until it was soft. Then I put it in a kitchen towel and rang it out to get all the moisture out of it. Next I added one egg, approximately a 1/4 cup of Parmesan cheese and some seasoning (garlic, oregano, basil, chives, about a tablespoon each). Mix well with your hands and spread out on a pizza stone. Bake on 450° until golden (about 11-15 minutes). Then top with sauce and your favorite toppings and bake for another 7-9 minutes, or until done. Cut into slices and enjoy. The good news is it is also gluten-free so my celiac friend could enjoy it with our family too. Want to learn more about adapting recipes and healthy eating? Take a class or schedule a consultation session with Coach Lora, theblonderunner@gmail.com Running & Triathlon classes are also available.